AAMP Membership is FREE for qualified audience marketing professionals. Member benefits include informative free webinars, access to regional events, and discounted registration for the annual AAMP Conference. Get the AAMP Advantage! EDUCATION. Attend AAMP webinars and events for real-life case studies, information on the latest technologies, and techniques to maximize your audience reach and marketing efforts. Nothing “pie in the sky” here – just practical knowledge and experience to get audience revenue results. NETWORKING. Whether in-person at events, or in our LinkedIn or Twitter groups, talk to other audience professionals and vendors for advice, feedback, and discussions. 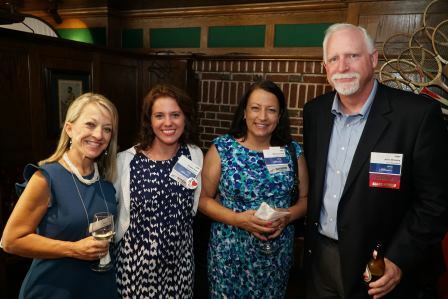 Members tell us their AAMP connections have led to better business decisions, long-term vendor relationships, and career connections! VALUE. AAMP is one of the easiest and budget-friendly ways to stay on top of audience marketing developments, meet colleagues, and attend world-class events. Membership is free for qualified audience professionals, and our popular annual conference is one of the most affordable events in the industry. AAMP – The Association for Audience Marketing Professionals – is a non-profit organization dedicated to the audience marketing industry. Our mission is to educate and connect audience development and marketing professionals. Originally established in 1976 as the WFMA, the AAMP is the only organization on the West Coast dedicated to audience marketing education, outreach, and connections. Our board members are made up of industry professionals with experience, tenure and influence in the industries they serve. Join us now!